This is a photograph of a poster I bought about 30 years ago when I was a rock-climber myself. 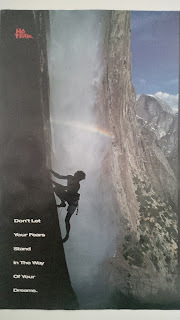 I've never climbed in Yosemite where the photograph is taken, but I've known a bit of exposure in my time, like the climber in the picture, both on a rock face and in life situations. The poster has been hidden between a filing cabinet and a cupboard for about 10 years. I retrieved it last Sunday after asking people in church to think about how their lives would have been different if they'd had - No Fear (the caption at the top left hand corner of the poster) We can all ask ourselves that question. Whether we are aware of it or not, fear colours almost every step we take in life especially a step into the unknown. Interestingly, fear is the opposite of faith. We usually think of doubt being the opposite of faith, but it's not, it's fear. The climber in the picture, has to have faith that he can climb the rock face. Doubt colludes with fear to stop us in our tracks. Faith helps us step out from beyond the fear zone, although fear might keep snapping at our heels like a mad dog. Faith keeps us one step ahead of all that would do us down.